I know, most of the art mentioned or included in my posts is a bit random--but this one is especially random. How so? 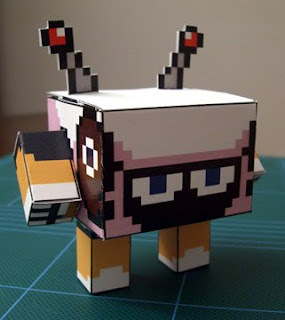 Well, some crazy fool created a Sheep Man papercraft for a Mega Man 10 art contest set up by the folks at Capcom. I just love the pixelatedness (yeah, I know that's not a real word) of the papery Sheep Man, don't you? When I first saw the picture I thought it was legos and I got really excited. Still cool, though. I wonder if they'll win anything. Oh, a LEGO Sheep Man would be even better, wouldn't it?